Vera Smirnova, born in 1966, graduated the Palekh art school in 1986, where she received guidance under prominent Palekh artists Khodov, Morokin and Golov. 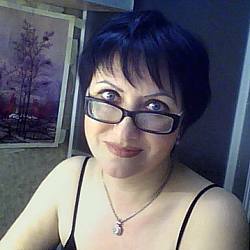 Since 1996, Smirnova has been a member of the prestigious Professional Union Artists of the Russian Federation. 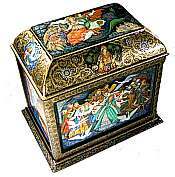 Smirnova has participated in "Across the Homeland" (1989, Moscow), "In Memory of S. Esenin" (1995, Ryazan) and "50 years of Victory in the Great Civil War" (1995, Palekh) and has a box in the Historical Museum in Moscow. You can also see her work "Tale of Tsar Saltan" in the book "Palekh and Palekhians" (Moscow, G.M.P., 1994). Smirnova is a very skilled and precise painter and has done some extraordinary works. She has mastered a special technique for painting faces, applying small brush strokes in layers to give them an uncommonly smooth and tender texture, something very difficult to do with egg tempera paints. Only a very select few Palekh artists are able to use this technique effectively. This may be one of the reasons Ms. Smirnova does some of the most exquisite portraits in Palekh, like a commissioned portrait work she did of Moscow mayor Yuri Luzhkov (given by someone as a high-level present to the mayor.) Smirnova has also done illustrations for books on fairy tales. Ms. Smirnova, a quiet and very pleasant young woman, lives in Palekh with her son Arsenij. On our visits to Palekh, she is very gracious hostess and fixes the most delicious Russian french toast! Search results:Page 1 of 4 total pages with 60 results. 0.75" x 0.25" x 1.50"
0.50" x 0.25" x 1.25"
3.75" x 1.25" x 3.75"
5.50" x 3.50" x 1.25"
1.50" x 3.00" x 4.00"